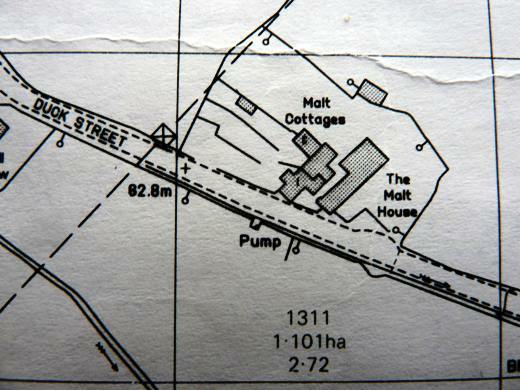 Malt House is one of the earlier stone built houses in the parish, though there is no documentary evidence of its date. Architectural evidence suggests that it was built during the 17th century. Later, in the 18th or 19th century, the house was considerably altered, the roof was raised, the gables removed and, probably, the kitchen (SW) block added. The outbuilding which forms the NE end was raised and given dormer gables in the 17th century, to match the rest of the house at that time. It is difficult to interpret the development of the building in any detail or with any accuracy. 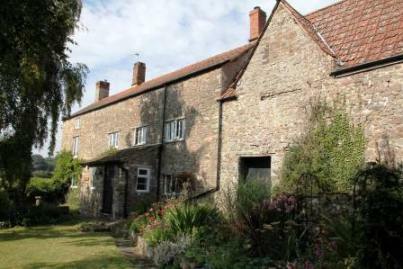 But it is tempting to speculate that the outbuilding was built originally as a malthouse, and that in the middle of the 17th century a new malthouse was built immediately behind the main house. 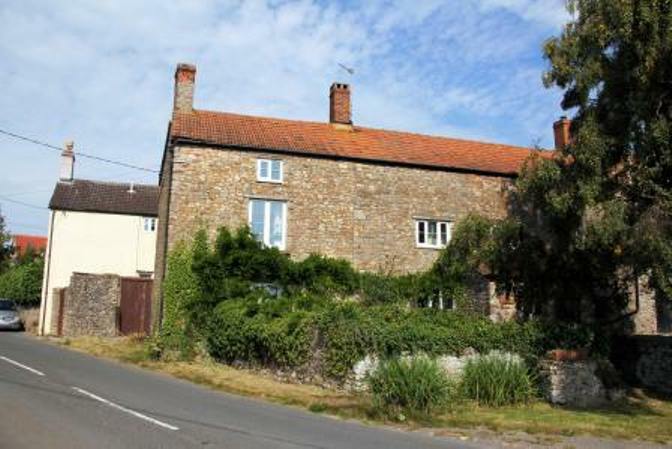 (This is the building now in use as three cottages. A lintel bears the date 1662.) At the same time, the original malthouse was altered and put to some different use. One of the first occupants of the house was John Hobbs, and he was followed by Thomas Prigg, yeoman, who had roots in Westerleigh. In 1672, Prigg paid the Hearth Tax on five hearths, which would accord with three in the house and two in the malthouse. Mill Farm was the only other five-hearth house in the parish. Thomas Prigg was followed by his son and by his grandchildren, two of whom, Elizabeth (spinster) and her brother William (`Gent! ), bought the property when the Verney family disposed of Tytherington Manor in 1728. They paid £145. Elizabeth's will is dated 1769 (she died in 1773) and she left Malt Farm in trust for seven young beneficiaries, three nephews and the four children of a fourth nephew, living at Westerleigh or Iron Acton. Inevitably over the years these seventh parts were sold, the first as soon as 1777. By 1783 John Smith, yeoman at Bishop's Farm, had bought three of the sevenths for £63. He acquired another seventh in 1785 (L20), another in 1786 (£18-10s. ); Smith's death intervened in 1788 (he was only 42) but his widow Martha bought the last two sevenths in 1797. Meanwhile, the house was occupied by John Ovens, who had married Ann Hobbs of the Newhouse family, only to be widowed within a few years. Ovens and then his son lived in Malt Farm up to the end of the century, until Martha Smith, who now owned all the property, let it to her brother Thomas (married to Sarah Parker). Thomas and Sarah's first two sons died young; their daughter Sarah married Robert Alway and emigrated to Canada; and their last child John married Ann Hobbs of Charfield in 1825 and lived at Malt Farm until his death in 1873. In both Itchington and Tytherington, the Smiths were prominent farmers. Back in 1789, the glebe was rented by Smiths, 55 acres at a yearly rent of £44-2s. Fifty years later, John at Malt Farm was still farming the glebe as well as his own 14 acres. He rented the earlier limekiln under the hill, bought land where he could, and by the middle of the century he was farming 100 acres. He acquired Pendick's from the patron of the church living, Rev. George Taswell; but he had pulled out a little before his death and was farming only 80 acres. When he died in 1873, he left the Malt Farmhouse, with four or five fields, to his eldest son John; they were valued at £1230. John seems to have sold the property quite soon and then spent the next twenty-five years as tenant of Tower Hill Farm; he sold to William Grove Salmon of Thornbury who probably bought it as a speculation, for in 1887 he sold it to the young Squire Hardwicke, in whose family it remained until it became vacant in 1955. Donald Gibbon at Boyts Farm then bought the property for the sake of the land, which surrounded his garden, selling the somewhat dilapidated house to William Brundrett in 1956. During the period from 1880 when it was tenanted, the list of tenants includes Thomas Plaisted (from 1881) and Henry Phipps who came from Oldbury before 1900 and returned there at the time of the 1914-18 War. Squire Hardwicke then put his head groom and coachman, Alsey Curtis, a widower, into Malt Farm with his sister Charlotte. 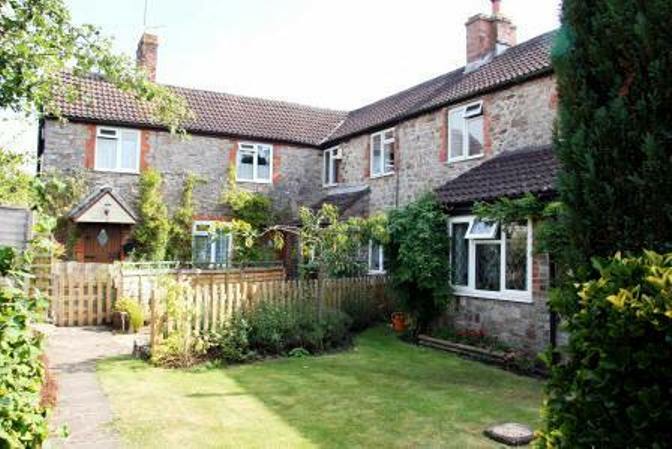 They lived there on a life tenancy, 'Aunt Lott' to the left as you went in the front door, Alsey on the right. She died in 1954, he in 1955. Through the 19th century, the premises included a cider mill as well as a malthouse. The last record of malting was in 1868; perhaps beer from the big town brewers was ousting that made in the village, although farmhouse beer was still being made in the parish well into this century. Cider orchards, however, were everywhere in the parish, though the agricultural depression of the late 19th century reduced the demand for cider and the orchards began to suffer the neglect which has continued to the present. 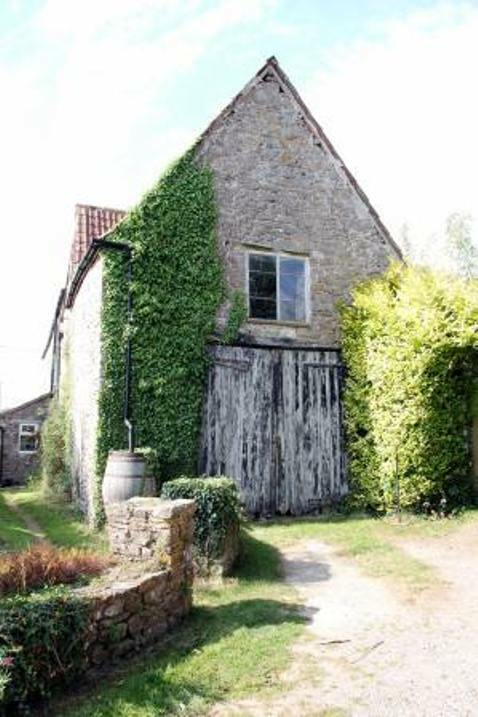 Nevertheless, cider was a customary drink and the mill at Malt Farm was in regular use until Alsey Curtis died. The circular trough and vertical crushing mill wheel were for many years worked by horse; but eventually a rotary crusher worked by a Lister engine was installed. The pulp then was transferred to the presses to extract the juice. When the mill was demolished, parts were incorporated into a mill at Brook Farm. Between the wars, Alsey's son, Alsey was helped by the Squire to set up a car repair garage in the old malthouse, with a petrol pump near the road; but the enterprise did not survive the depression, with many customers failing to pay their bills. 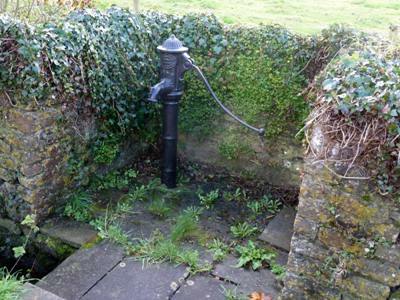 The photo above shows the pump on Duck Street opposite Malt Cottages. The cottages, converted some 100 years ago, have had numerous tenants. At the time of the sale of the Hardwicke estate in 1936, C H King, in charge of the quarry office and married to the stationmaster's daughter, lived in No 1 and bought the three cottages in one lot for £400. 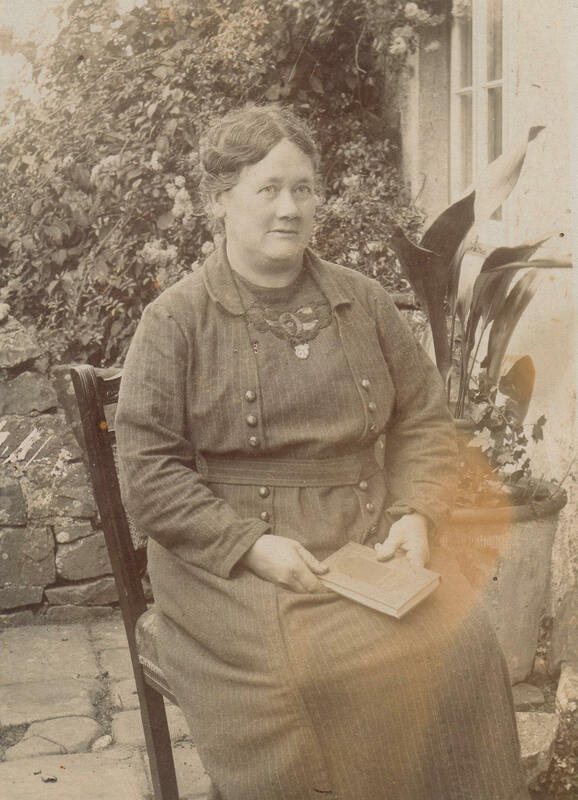 The Kings were followed by Beatrice Rose Kingscott (from Edwards Farm), while in No 2 for about 40 years were George and Lily Livall. No 3 was occupied for many years by Alsey Curtis' sister 'Nan', the Squire's cook at, first The Grange and then The Manor, who married William Niblett. Click on the thumbnails to view the photographs below. 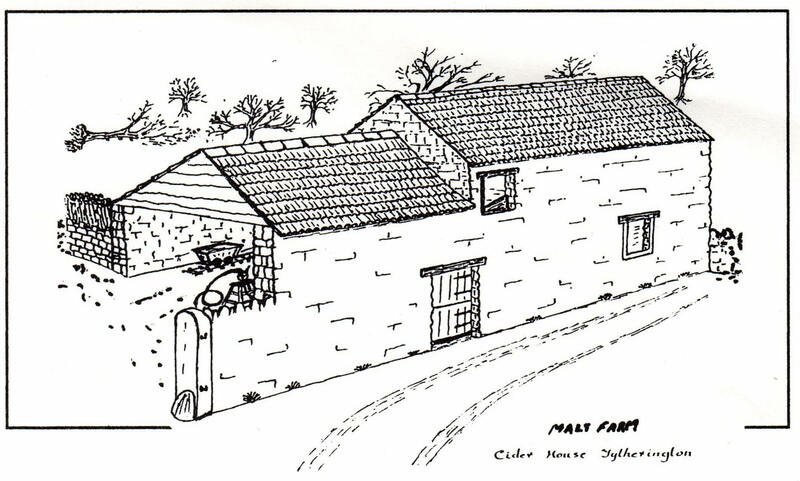 Sketch of the Malt Farm Cider House (now demolished) by David Niblett. Cider apples would be poured through the small upper window directly into the press inside the building. A trolley on rails was used to move apples etc around the building. There were two presses one of which is now at Brook Farm.